Tennent Caledonian Breweries were hosts at a tasting and buffet in the Radnor Hotel, Clydebank. (Left to right) Mr. E. Tarquini, Cisco; Mr. D. E. M. Matthews, Tennent Caledonian; Mr. P. Walters, The Maggie; Miss S. Hytch; Mrs. P. Walters; Mr. A. M. Brown, Station catering manager, Travellers Fare, Glasgow; Miss M. Irving, bars manager, Queen Street Station; Mr. W. H. Finlay, sales director, Tennent Caledonian; Mrs. R Fretwell; Mr. M. B. P. Fraser, Tennent Caledonian, area sales manager, Glasgow West; Mr. R. Fretwell, The Oriental. 1975. Included are Mr. J. G. Angus, Tennent Caledonian, regional sales manager west; Mrs. and Mr. R. Kinloch, The Vale; Mrs. and Mr. E. Giannini, Ben Lomond, Balloch; Mr. J. R. D. Swan, marketing director, Tennent Caledonian; Miss E. Moores and Mr. L. Paleja, the Albany Hotel, Glasgow. 1975. In 1978 Mr M D E M Matthews, at present marketing director of Tennent Caledonian Breweries, becomes sales and marketing director with effect from February 1 as a result of a restructuring of the company’s sales division. This restructuring, as reported in last month’s issue of the Scottish Licensed Trade Guardian, arises from the departure of Mr W H (Bill) Finlay, sales director. After a lifetime in the trade, starting as a boy of 14, James Horn, representative. Tennent Caledonian Breweries, has retired. 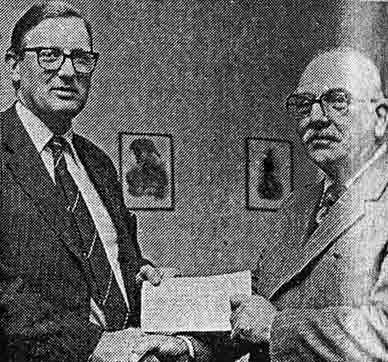 He is seen (right) receiving a presentation from Mr. M. D. E. M. Matthews, sales and marketing director. Mr Horn joined J & R Tennent in 1954, covering the south and west areas of Glasgow and later, with Tennent Caledonian, he looked after Glasgow south and the Clyde coast.